Do you know the Memphis Group? No, the Memphis Group is not a new band out of Nashville–although it takes its name from a Bob Dylan song. 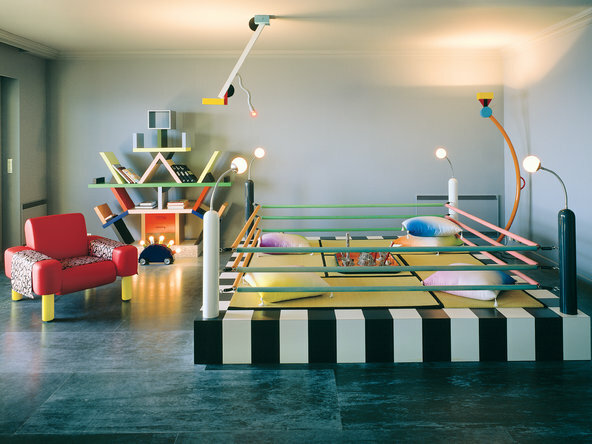 Architect and designer Ettore Sottsass founded the Memphis Group (or, simply “Memphis”) in Milan, Italy in 1981. Michael Graves, Alessandro Mendini, Andrea Branzi, Matteao Thun, Michele de Lucchi , Shiro Kuramata, Arato Isozaki, Nathalie du Pasquier, George Sowden and Hans Hollein were all members, among others. They designed Post-Modern furniture, fabrics, ceramics, glass and metal objects from 1981-1987. Contemporary designers have taken notice. Memphis inspired Christian Dior’s 2011-2012 Fall/Winter haute couture collection (seen in the first photo). Hot Brit product designer, Lee Broom’s Hoop Chair recall the Memphis “First” chair seen above. Contemporary furniture designer Matthew Sullivan claims in T Magazine that he is striving to create “a more palatable version of Memphis that can harmonize with any interior style.” His work riffs on shapes such as Greek columns and ziggurats that recall the unique forms of Memphis, but it is distinguished by his use of natural materials like wood and marble. Plus he employs a much more subdued palette. What Do You Think of Memphis? In my opinion, a room full of Memphis is an assault to the senses, although Karl Lagerfeld had one. T Magazine featured arguably tasteful interiors that incorporated Memphis. First, President Gerald Ford’s home is on the cover with a Memphis light front and center. What an eclectic mix! The tasteful nature of the second home is not a surprise to me. Nicolas Ghesquiere’s Memphis choices–a console by founder Ettore Sottsasss and a pair of chairs by Shiro Kuramata-found in his Paris apartment exude elegance. That lovely 1940s mirror certainly helps. Ghesquiere’s selections feature subtle colors and employ natural materials more akin to Sullivan’s work than the standard Memphis fare. So what do you think of this revival? Are you ready to jump on the Memphis bandwagon? A little bit of Memphis, easily changed. Photo credits: Dior. Lee Broom’s Hoop chair from dezeen. Room full of Memphis from wikipedia. Matthew Sullivan’s designs from his website. Ettore Sottsass from the New York Times. Nails. Memphis collage: Poster Lido Sofa First Chair Michele De Lucchi designed “Lido”, a colorful sofa, and, in 1983, the “First” chair for Memphis. Modern Super Lamp Bookcase/cabinet by Ettore Sottsass Textiles by Nathalie du Pasquier & George Sowden Vanity by Michael Graves Memphis Lamp by designed by Michele De Lucchi Chair by Alessandro Mendini. Gura quote page 99 of her book, Design After Modernism.